Flexibility is a key benefit of leasing temporary fabric structures, making them a fast, scalable solution for periods of rapid growth. Leased fabric structures can be added and expanded as needed then removed when your project is complete. Recently, a petrochemical company contacted Mahaffey during a period of extreme, fast-paced growth. They needed lunch and break facilities to support an addition of nearly 8,000 craftsmen to their workforce. 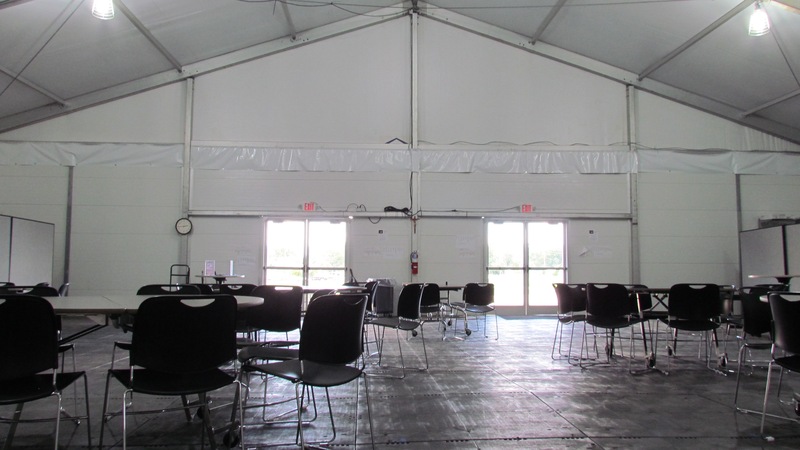 When Mahaffey arrived on-site for the installation, it was discovered that one of the 15 concrete foundations the client’s contractor poured for the lunch tent fabric structure was not the size the client ultimately needed. This meant that the temporary fabric structure solution would not fit. The dimensions of the concrete slab were approximately 4 inches too short to accommodate the raised brick edge feature (pictured below) used to provide optimal water drainage. While temporary structures are flexible and scalable, concrete slabs are not. This could have meant that the client would have to re-pour the entire foundation--a lengthy and costly option. Fortunately, custom solutions and rapid response are Mahaffey’s specialties. Because of our creative problem solving approach, we were able to deliver the ideal solution for this client that met their timeframe, budget and engineered structural requirements. 15 engineered lunch tent structures, ranging in size from 2,500 square ft. to 13,200 square ft. Temporary fabric structures can be installed in optimal locations on your site—on virtually any ground surface or on a poured concrete foundation. Structures used as lunch and break areas should have flooring that can be cleaned and sanitized daily – concrete pads are an ideal option. 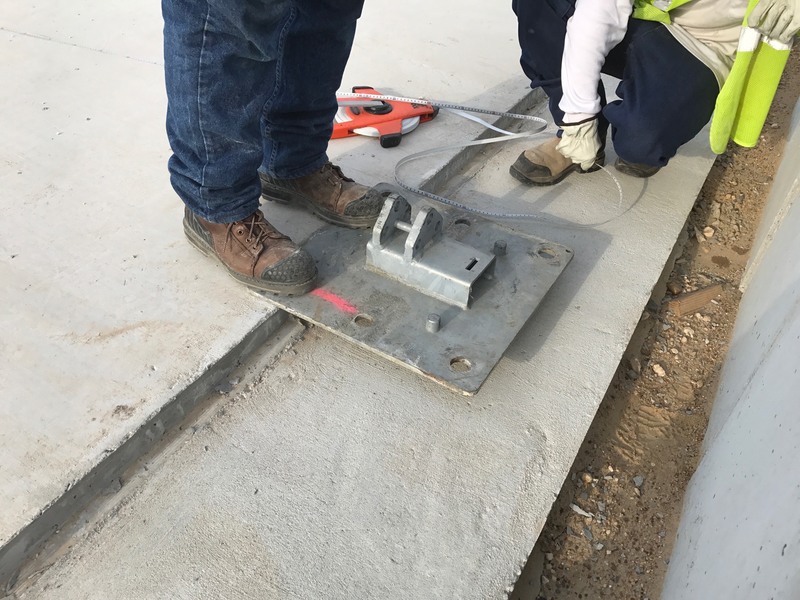 When it was discovered the concrete slab poured for one of the lunch tent structures was the incorrect size for the client’s need, Mahaffey provided a solution that would minimize added time or expense without compromising safety or structure integrity. To accommodate the brick edge needed to provide water drainage and keep the lunch tent structure’s interior dry, the Mahaffey team built up the sections of the structure that were overlapping the designated anchoring points with engineered structure supports. This solution saved the client the added cost that would have been associated with re-pouring or building up the foundation without diminishing the efficacy of the final product. What’s more is that this design pivot added mere hours to the project versus the days a new foundation would have required. And because Mahaffey’s concrete anchors are engineered with specific uplift designations, we knew the temporary fabric structure could withstand its expected wind load. At Mahaffey, we make the commitment to never provide a structure that isn’t engineered for safety. In this case, despite the concrete foundation dimensions being off we used our expert knowledge to find a new solution using tested materials and methods. Creative problem solving and contingency plans are essential for any project or operation. Even the most detailed plans are subject to last-minute changes. Mahaffey project and construction managers are known for creative problem solving. We successfully provided structures to meet this client’s needs and worked closely with them to quickly find an ideal solution to an unexpected situation. No one wants to encounter unexpected problems on the job site. However, when they do occur, you need a creative vendor with experience to provide cost-effective and safe solutions you can trust. Are you looking for a trusted partner you can depend on? Contact us today and let’s talk about how we can solve problems together.